Is it unfair to compare a movie to the book on which it’s based? Yes, “the book was better”, but I think it is inherent that any derivative work be compared to its source material while understanding they are different media. The concept of The Great Panic, which ultimately leads to societal collapse, is a fabulous and original idea. I see none of these qualities in this trailer. In fact, I see none of the ground-breaking and original ideas Brooks brought to his novel. First, we have explosions in the distance, an authority figure barking orders and then a mad panic. Seen it: Cloverfield, Dawn of the Dead (2004), I Am Legend. We also have military hardware flying in to attack the threat. Again, Cloverfield, I Am Legend. I’ll even throw in the Resident Evil films. Then we have the fast zombies. Seen it: Dawn of the Dead and 28 Days Later. But this last point bears some discussion below. Finally, we smash cut to exciting scenes… just like every trailer for the last 20 years. I see none of the intimacy and human storytelling from the book. This looks like another, fast-paced action movie to me. I don’t see horror and I don’t see drama. The first season of The Walking Dead proved these two things can not only go hand-in-hand, but each augments the other when they do. Oh yeah: Can we stop it with the Inception BWONG already!!! In the book, the zombies were slow. This element was important for how humanity regained control of the world. 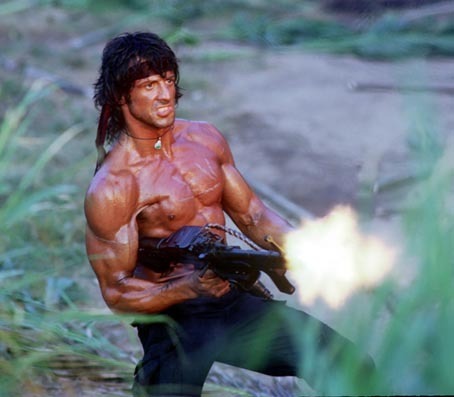 Not to go into spoiler territory, but any Rambo-like soldier with machine guns blazing would not last long. In keeping with the themes of the book, soldiers needed to act together in a calm, rationale way to survive. They lined up shoulder-to-shoulder, firing a single shot one after another. I think there was even a drummer who set the cadence for firing. Breaking ranks meant death. In the trailer, soldier rely on automatic weapons, which we all know won’t work. I will say the scene at the 1:18 mark is effective in show the futility of conventional tactics against the undead. But against fast zombies I don’t see how mankind can retake the world as they did in the book. So where is the hope that fuels a good apocalypse story? Zack Snyder and Danny Boyle used fast zombies the same way Spielberg did with the shark in Jaws and T-Rex in Jurassic Park. Keep them off screen until needed. Snyder kept the tension up by having a single zombie appear now and then, or keeping the zombie horde outside and (temporarily, at least) at bay. A massive (or should I say MASSIVE) zombie horde will be scary the first time, but can’t be sustained throughout a film. One note, though. At the 2:08 mark, Pitt sells the fear and paranoia with just the shift of his eyes. All of that is to say this is just a trailer. It is meant to get people excited. I was about to say “and into the theater” but that’s 7 months away. The next trailer may have a totally different tone than this one and more accurately reflect the film. Still, the only thing new I see here is a big name actor with serious chops in (and backing) a zombie film. That, at least, gives me some hope. 5 comments on "Review: First World War Z Trailer"
You pretty much summed up my thoughts on the trailer. These look like salmon trying to spawn, not zombies, and certainly not Brooks’ zombies. But I’m still holding out hope for a good movie. PS — If you’re a zombie fan, I’d love for you to check out INFECTED. It’s an interactive zombie book, where you can find out if you would survive the zombie apocalypse. As you say, most of this trailer suggests a “high octane” take on the Battle of Yonkers. Considering the many emotionally charged, thought provoking, politically laced vignettes within the book, going for a “big dumb action movie” seems the exact opposite way to draw in fans of the original text. Quite a shame. When has drawing in fans of the original text ever mattered? Unless Darabont is involved, forget about it. In the book Brooks actually stated that “fresh zombies” we’re much faster then those that had turned several weeks or months ago and much of the trailer seems to show the panic it’s possible that the zombies slow down towards the end of the movie making the retro tactics plausible. I’d forgotten that, Tommy. Here’s hoping. I just hope they don’t go all 28 Days Later and, by the end, the zombies are slumped in the streets and no threat.